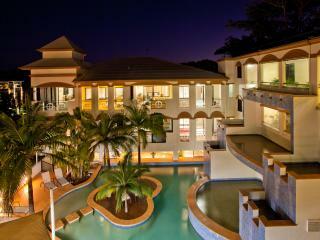 Regal Port Douglas is ideally located at the quieter end of Macrossan Street, only a short stroll to Four Mile Beach. World class restaurants, quaint old Queensland Pubs, resort and boutique shops are all right on your doorstep! 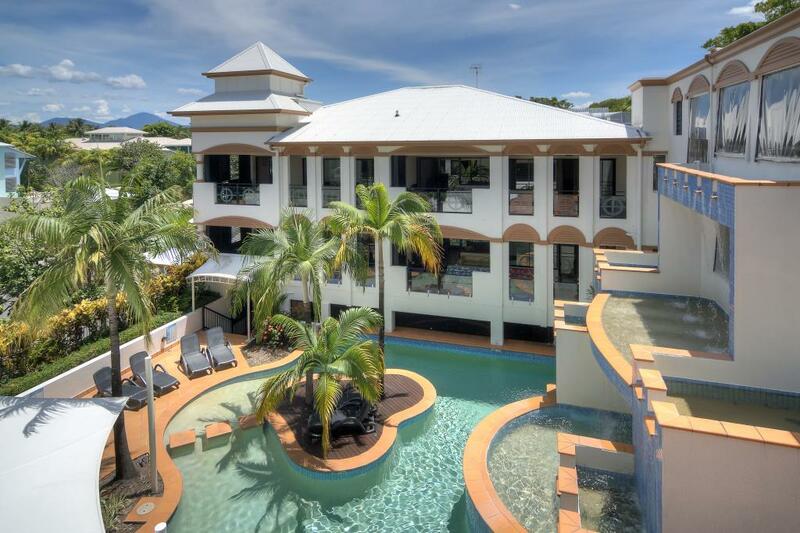 This Port Douglas accommodation offers guests a choice of Studios and self contained luxury 1 & 2 Bedroom Apartments, with either a spa in the bathroom, or jacuzzi on the balcony - or even both! Relax to the sounds of the waterfall, featured around the lagoon style pool or take a walk along the beach and watch the sun set over the Inlet. Regal Port Douglas is only a short stroll from The Reef Marina where you can enjoy a day trip to the Great Barrier Reef or one of the Islands. This North Queensland Resort is the ideal place to base yourself and your family on your next Port Douglas holiday. 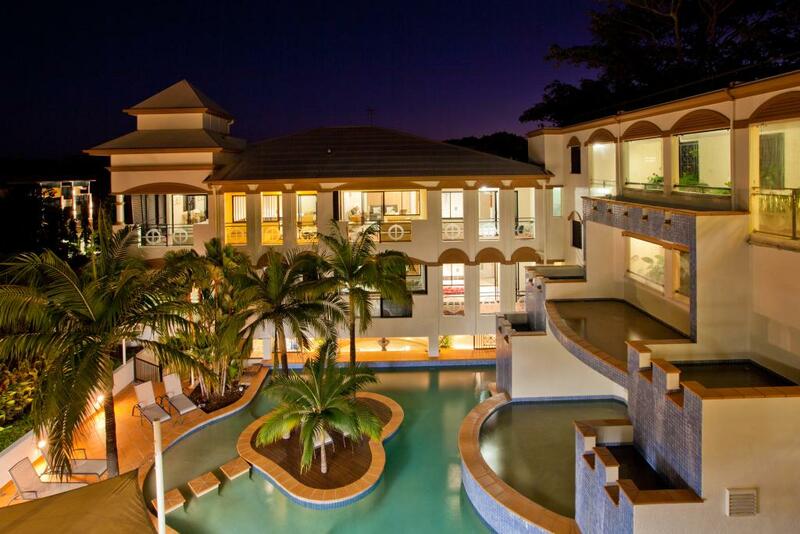 At Regal Port Douglas the choice is yours! Choose from a Studio, 1 & 2 Bedroom Apartments with either a spa or jacuzzi - or even both! Studio Indoor Spa Apartment: Located on the ground, 1st and 2nd levels. Bathroom with a two person spa bath. Bedding is 1 King Bed. Maximum room capacity is 2 Adults. 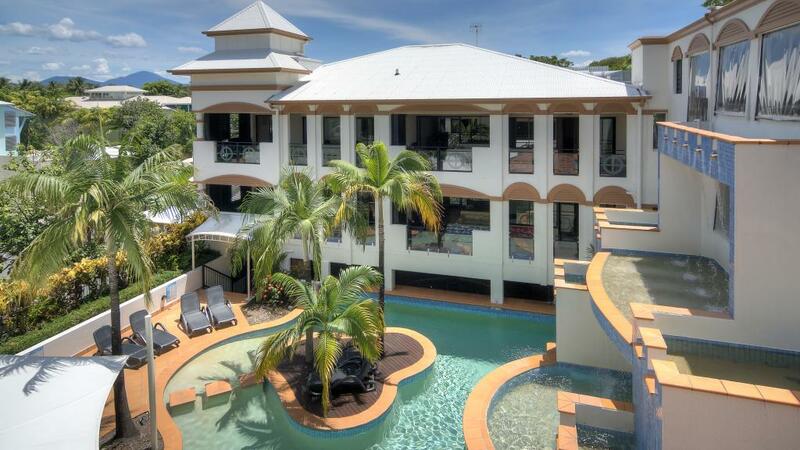 Apartments at Regal Port Douglas are a great choice while spending an extended time in Port Douglas. 1 Bedroom Indoor Spa Apartment: Are situated on 1st or 2nd levels, with either an outlook over Macrossan Street or the Pool. Bathroom with a two person spa bath (indoor). Bedding is 1 King Bed. Maximum room capacity is 3 Adults & Children. 1 Bedroom Outdoor Jacuzzi Apartment: Located on the ground, 1st and 2nd levels. Bathroom with shower and balcony with jacuzzi. Bedding is 1 King Bed. Maximum room capacity is 3 Adults & Children. 1 Bedroom Rooftop Jacuzzi Apartment: Features a huge private rooftop courtyard, private jacuzzis, barbeque, and an entertainment area under shade sails. Bedding is 1 King Bed. Maximum room capacity is 2 Adults. No children or infants are allowed in this room type. 2 Bedroom Spa & Jacuzzi Apartment: Located on the ground, 1st and 2nd levels. A combination of a Studio & 1 Bedroom Jacuzzi Apartment. Bedding is 2 King Beds. Maximum room capacity is 5 Adults & Children. From your accommodation at Regal Port Douglas, you can access an array of restaurants, bars, cafes and shopping facilities that are just a short walk from the hotel. One of the most enjoyable parts of a Port Douglas holiday is exploring the award wining restaurants and cafes that serve a variety of cuisine, from beautiful North Queensland seafood to Australian contemporary menus or why not try both with an Asian influence. Breakfast, Lunch or Dinner, the selection in Port Douglas is yours - its all within walking distance and with a choice to suit all budgets. During peak season it is advisable to make a reservation.